Two Kibdelone C syntheses were published in a recent JACS issue with the publication-received dates just 12 days apart: the first one from Boston University (DOI) and the second one from the University of Texas (DOI). Research groups are usually aware of each other doings so the effort must have involved lots of (unpayed) overtime and stress. Here are some of the highlights from the Sloman / Bacon /Porco synthesis. 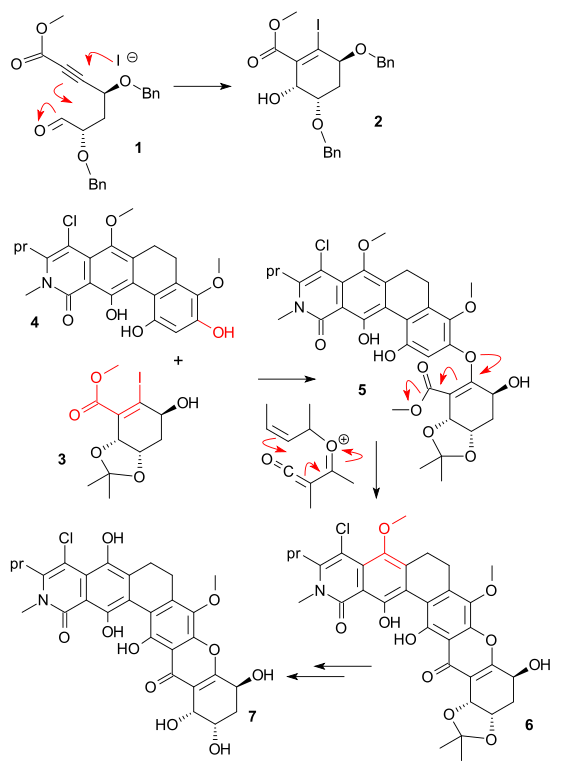 One of the key steps was an intramolecular halo-Michael aldol reaction of Aldehyde 1 to form alcohol 2. The excess reagent in this reaction was magnesium iodide and in the most favorable cyclic transition state magnesium can chelate three oxygen atoms and not just two which explains the observed diastereoselectivity. After a round of deprotection-protection 2 returned as 3 in a oxa-Michael reaction / dehydrohalogenation with phenol 4 in DMSO with tripotassium phosphate to form tetracycle 5. A dozen other bases failed in this particular reaction and workup was problematic due to the acid-labile carbonate groups. The next step was a formal intramolecular Friedel-Crafts acylation of 5 (after saponification) to hexcycle 6. Again the regular FC reagents failed and recourse was taken to the rather obscure cyanuric acid. Although the original protocol also listed aluminum chloride, Sloman et al. found out it was not really needed and hence they came up with a reaction mechanism involving electrocyclization / re-aromatization around an intermediate ketene (the chemical literature is rife with protocols demanding reagents that serve no purpose). The final stretch should be uneventfull but again problems were reported: how difficult can a demethylation be? Difficult when you want to demethylate just one of the methoxy groups present and difficult when you can also oxidize other parts of the compound. In the end the reaction yielded kibdelone C 7 with Ceric ammonium nitrate / acetic acid.